Every picture tells a story, right? Well, the same is true for tickets and this product pairs up your ticket and 5-by-7 photo to create exactly the Ticket Frame you want. Each frame comes with professional mounting corners to secure your ticket as well as easy-to-follow instructions for adding your items. Be sure to select your frame's orientation by viewing each sample (all four styles are shown). Overall size ranges from 11 x 11 to 10 x 14 depending on photo orientation and ticket size. Sports Fans. 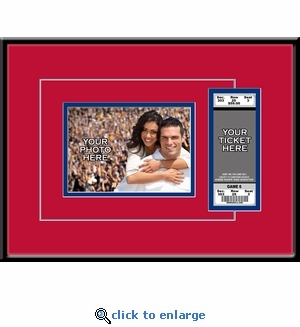 Your frame will be double matted in colors to match the MLB, NFL, NHL, or NBA team you select above. Every picture tells a story, right? 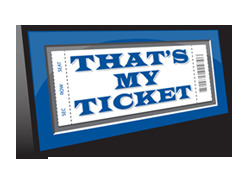 Well, the same is true for tickets and this product pairs up your ticket and 5-by-7 photo to create exactly the Ticket Frame you want. Each frame comes with professional mounting corners to secure your ticket as well as easy-to-follow instructions for adding your items. Be sure to select your frame's orientation by viewing each sample (all four styles are shown). Overall size ranges from 11 x 11 to 10 x 14 depending on photo orientation and ticket size. Sports Fans. Your frame will be double matted in colors to match the MLB, NFL, NHL, or NBA team you select above. Concert Goers. Select from White on Black and Black on Black from atop the Mat Colors menu.